Growing up with a family full of physicians, as well as what I studied in school, I knew I wanted to be in the medical industry. With this as a foundation as well as my background in playing sports and always succeeding in a competitive environment, I always knew Medical Sales would be a good route for me. The experience kept me busy, as I made a point to stay motivated throughout the process and network or set up a meeting every single day. I wanted to make the investment in myself and gain a strong foundation so that I could be a successful and oriented rep from day 1. Very busy! But I was excited to learn everything I could during my time there. Rebecca was a great mentor and teacher throughout the whole program, so I feel like I got a lot out of it and was able to stay motivated throughout. I reached out to my manager on LinkedIn, and initially we had a brief phone call. Then next steps, I met him at Starbucks, where I presented my business plan to him. At that time, he said it would be a minimum of 45 days until he could be approved to have an Associate. I followed up with him and thanked him for his time and meeting with him. Next, I met with him and one of the owners of the distributorship for a meeting, where the typical interview questions were asked and they got to know a little bit more about my background. From there, I was invited to a team outing for them to see how I would engage with the team. After the team outing, I had a meeting with the manager explaining where they were at in the process. I had 2 more in-person meetings with the regional manager and territory manager, and then was offered the position. Throughout the whole process, I checked in regularly to let them know I was still interested and to get an update with where they are at. They mentioned that was a huge selling point. The Business Plan and my preparation with product knowledge helped me in my initial steps. My manager said what set me apart other from others was my persistence! Even though it was a lengthy process, I was patient and persistent throughout, which made them confident about selecting me. 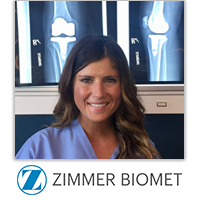 Just getting started, but so far, I have been able to attend an Adult Deformity course and participate in a Cadaver lab with surgeons who are current customers of Zimmer Biomet. I was told that my position is a “fast track” route, so I will be covering cases within a few months of starting.